Bernice Bennett is the former Coordinator of the African American Genealogical History Group at the Washington, DC Family History Center. The group was initiated over 2 years ago when the FHC announced that they had an African American Specialist. The FHC is located near the Mormon Temple in Kensington, Maryland. Bernice led a group of African Americans to research their family genealogy. 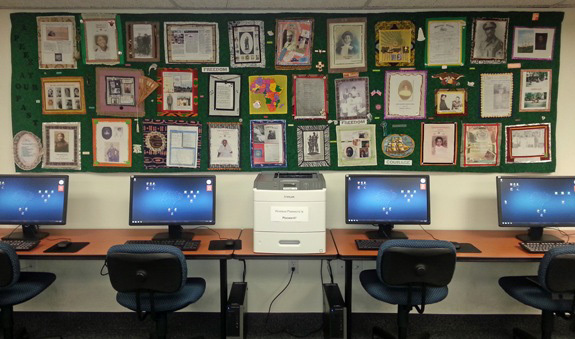 The Family History Center provides researchers with access to microfilmed family history records, family history computer resources, and Internet genealogical websites. The Center also has books on church records, census, military, property, and maps/atlases. Researchers use these, and other resources to gather additional information about their ancestors. Together they weave family histories tracing back centuries and support and celebrate with each other, whatever they find. The Washington Post did a feature on the program that included a two-minute video clip and a front-page news story. The flyer, "Join the African-American Genealogical Interest Group at the Washington DC Family History Center," provides details focus areas for research and the hours of operation. The highlight of the African American Genealogy Interest Group's activity in 2013 was the unveiling of the African American Heritage Quilt.